Reuse of historic post and beam frame at core of new building. 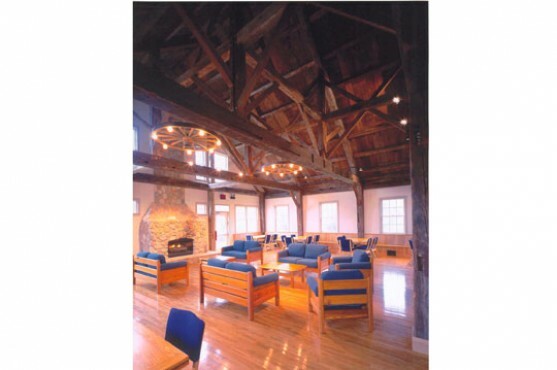 The Lodge at Colby-Sawyer College is the student center for the campus community and has long been a part of the college’s lore. The main room is a reassembled post and beam frame of now extinct American Chestnut. This frame was from the school’s original lodge located on Lake Sunapee. We documented the original structural frame for later reassembly as part of this project. That frame contributes a level of detail and interest that is difficult to replicate. Complementing the reassembled Lodge frame is additional space to house a food concession, game room, computer access stations, and exhibits of college memorabilia.